Raw materials: a permanent investment sector. Rising gasoline prices made motorists nightmares and fever dream of gold gold miners, but behind these two iconic areas are a multitude of other investment opportunities too often forgotten. The purpose of these lines is to draw your attention to an important point: There is always a sector among the raw materials on the verge of a period of "euphoria". With peak production, oil is the heart of the secular bull cycle on resources and this should be the primary concern of an investor in commodities. Oil leads to rise in other energy sources such as natural gas, coal or uranium. The three are currently unpopular, for different reasons. Natural gas, due to regional overproduction in North America, due to shale gas, uranium because of the accident at the Fukushima plant and coal due to carbon dioxide emissions. You can almost forget the coal so that the OPA has decimated the mining sector. There are only a few, rare, large independent companies who can be counted on the fingers of one hand. If North America has too much natural gas in Asia, it is ready to relieve America of this "burden" of LNG terminals are under construction or planned across Canada, the United States and in the world. Uranium mines world-class look more and more to the 12 labors of Hercules and the best projects are rapidly targeted for takeover. Gold and silver have demonstrated for 10 years they had nothing barbarous relic and they still offer excellent protection against inflation. However, platinum and palladium are often forgotten in the family of precious metals. It is wrong, has many industrial uses, reserves are limited, geographically concentrated and very accessible. Industrial metals like copper, zinc or iron, remain under the radar of investors. However, these three sectors are the champions of OPA 10 years. All deposits of iron, zinc, copper, close to production or in production are the subject of a takeover bid, participation, advance purchase of production by Chinese companies, Japanese, Korean companies Wholesalers or large industrial groups wishing to secure their supply. Vertical integration is no longer limited to large groups, dating back even to the states. Finally in Asia and the United States, as few policies in Europe seem to have realized the need, not strategic, but vital resources sector. Old Pavlovian response, the following two centuries of contempt vis-à-vis resources. Middle East, from large industrial or agro food. Potash, determine element in the manufacture of fertilizers has seen its heyday, and his second "rush" in 2010 when the World No. 1 mine production has made a takeover bid (rejected by the Canadian authorities) on the No. a global potash industry. Another investment opportunity, often remained in the shadows: the diamond. There is no call, Putt, no financial product on the price of diamonds and that's good, but in return no one will sell you the diamond as an investment. Yet, India and China, the diamond is experiencing double digit growth (even Asian). The No. 1 world's mine production has announced his retirement from the industry, not by lack of opportunity but because of the impossibility of finding a world class mine. The No. 1 world's diamond production, more than a century, he was the target of a takeover in virtual indifference. These are just some examples I could mention lithium, geothermal, high-energy, hydro-electricity (excellent defensive sector), manganese, cobalt, molybdenum, phosphate, water , wood, arable land, lead, tin, nickel, cement, niobium, rhodium. I could also enumerate the long list of companies that you'll never buy because of the hundreds of OPA experienced by the resources sector over the past decade. On the chart below, each resource is represented by a company, because the indexes do not exist for all these resources. 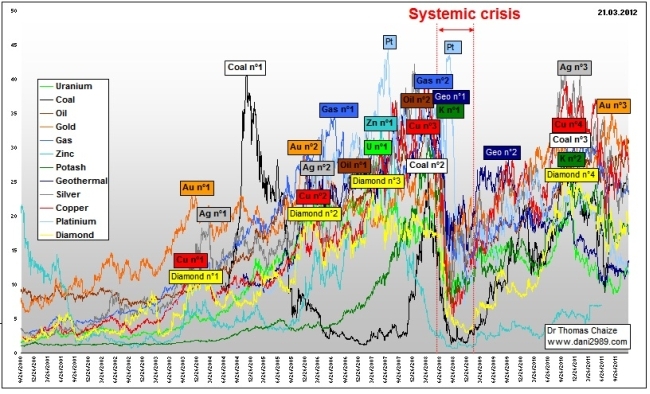 Notice that, for 10 years, there is always a sector that is in a phase of "boom", apart from during the systemic crisis of 2008-9. But then, all raw materials have experienced a strong upward phase at the same time. So the obvious question is: what is the next area? In 2003-4, I wrote about gold, silver, oil, and in 2004 on China and the 1st materials, and the Napoleon gold coins in 2005, uranium, gas natural in 2006-7, on oil, the high geothermal energy in 2009, the black gold and yellow gold, the high geothermal energy, zinc, coal in early 2010, on the diamond, the African oil and potash. For 12 months, 7 of my subjects in 10 themed oil (Elliot wave, the price, the inflection point, the marginal cost of investment).